Are you sick and tired of seeing the same design in your bedroom every day? Adding a sitting area is a lovely way to increase its functionality and space. A stylish chaise lounge or a pair of vintage Morris chairs instantly create a cozy reading spot or an intimate space to unwind at the end of the day. 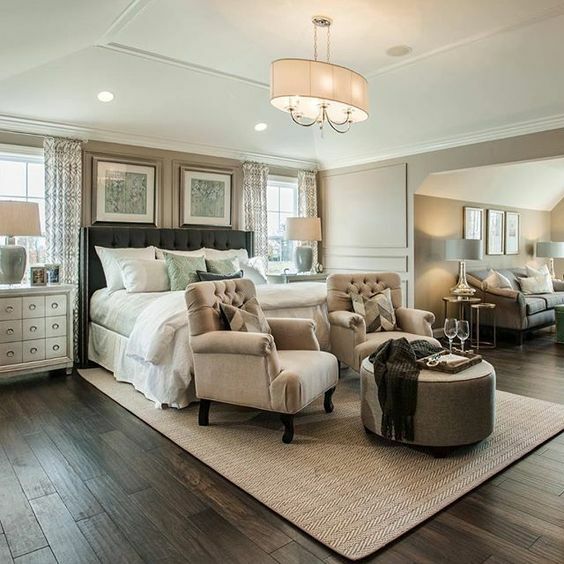 Take a look at these 26 master bedroom sitting area photos and get inspired to create your own. Enjoy! This cozy contemporary master bedroom’s subtly patterned linens offer instant relaxation. The two stylish armchairs, the wooden floor and the unpretentious rug made by Stanton Carpet that runs underfoot, make this master bedroom with sitting area looks like a piece of art. 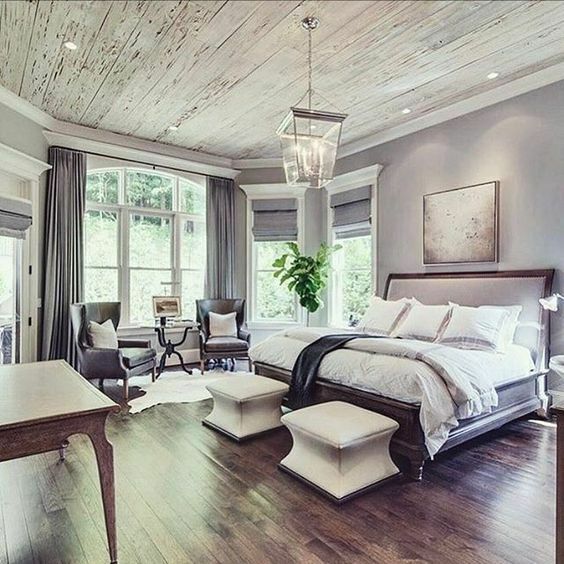 This glam grey bedroom would be a great spot to unwind and rest after an exhausting day at work. 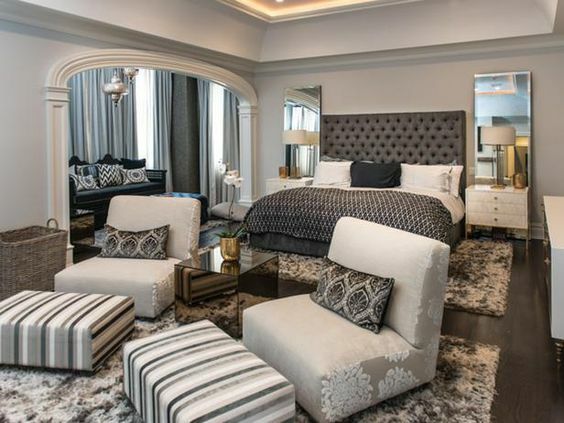 The designers behind this project of a master bedroom suite with sitting area – Vicki Saxton and Renée Prudhomme have added different types of sparkle, from lush silver to beaded decorative pillows. Moreover, there are some light-reflecting pieces to give the room depth and life. 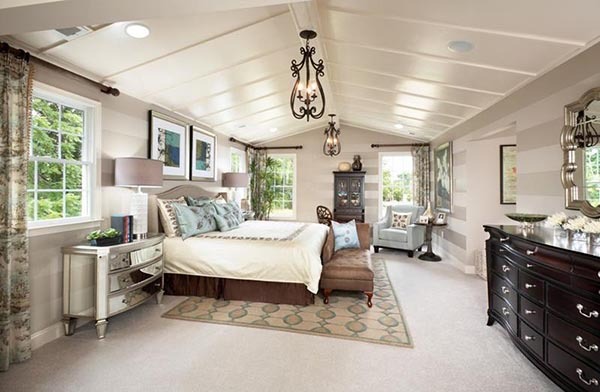 Here is something for those of you who have a smaller master bedroom at home. By decorating with fluffy cushions and larger nightstands and lamps, you are adding some texture and creating nice layers. This top-notch sitting area is sparked with just a slight hint of color. I like how the antiques are well combined with clean-lined modern pieces. 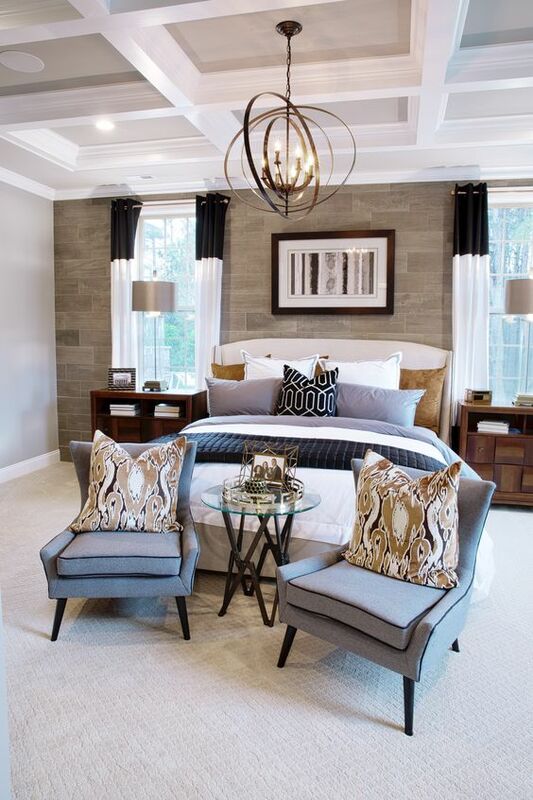 The symmetrical mirrors give the final touch of this stylish master bedroom with sitting area. 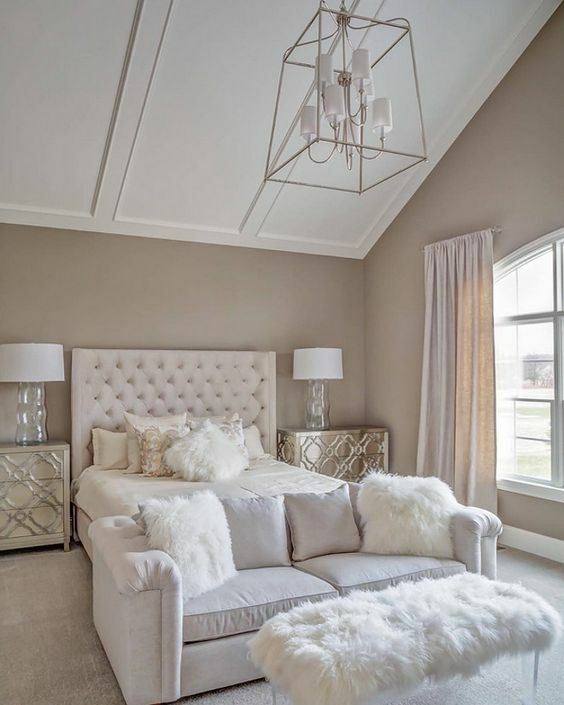 Here is a chic white, gray and beige master bedroom. The design itself is very clean and traditional. However, take a look at the eye-catching farmhouse pendant light and the wall art! Love them! I would call this design very bold as it is a real explosion of ornaments and motives. This bedroom color scheme creates a vintage flair with a soothing yet cool atmosphere. It would pair well with an industrial chandelier. 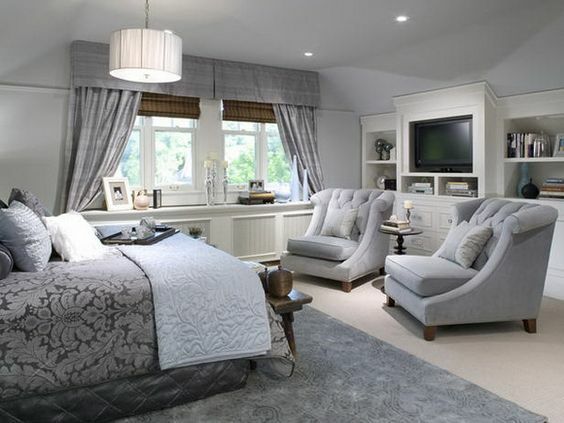 I love this bedroom design because it blends well contemporary comfort with traditional style. The high ceilings and the large mirror make the room feel much more spacious. The two sage-colored armchairs and the camel throw keep the mood casual and unpretentious. 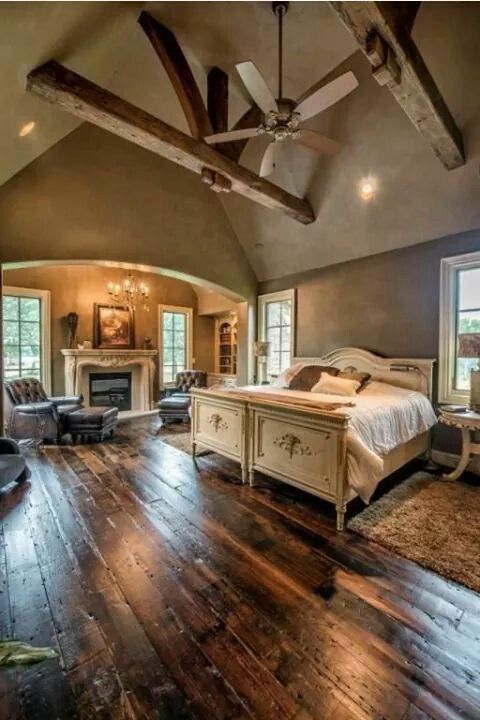 This luxurious bedroom with high ceiling and a romantic scarce lighting is a great example of how to decorate a spacious master bedroom without making it “too much”. Plus, it has a great spot for lounging! I wouldn’t deny that lush mint green and muted blue are creating a calming vibe in this beautiful master bedroom with a vintage accent. The first thing I’ve noticed when I saw this picture was the stone accent wall that perfectly balances the color tones in this design. The small glass table is a great addition to this design because it does not steal the focus of the beautiful sofa and the master bed. 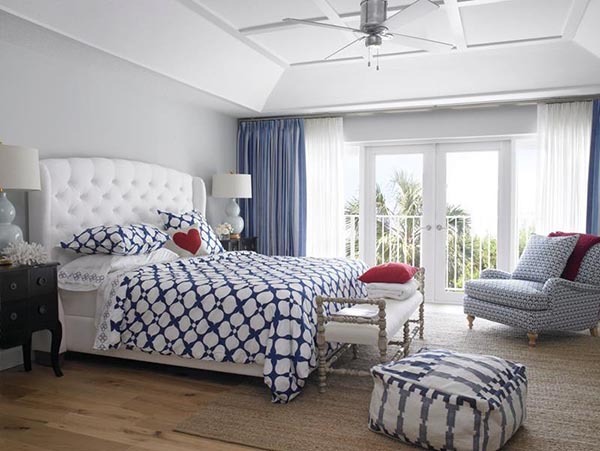 The white and blue color pattern of this bedroom adopts an almost maritime aesthetic. 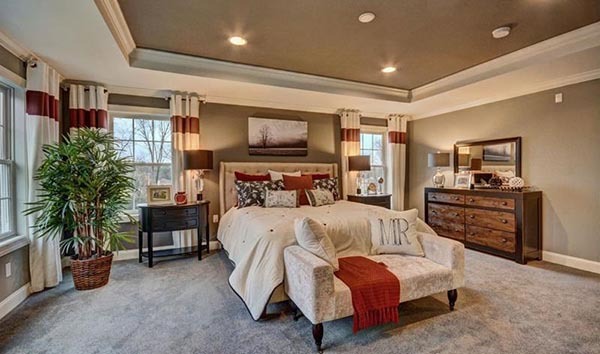 The cute red accents present the exact touch this master bedroom design needs. This design combines rustic, vintage, and modern in one. The cute small bench at the foot of the bed here is a lovely choice for lounging. With the soft grey color palette of this modern master bedroom with sitting area, the bright piece of artwork is a brilliant design choice. 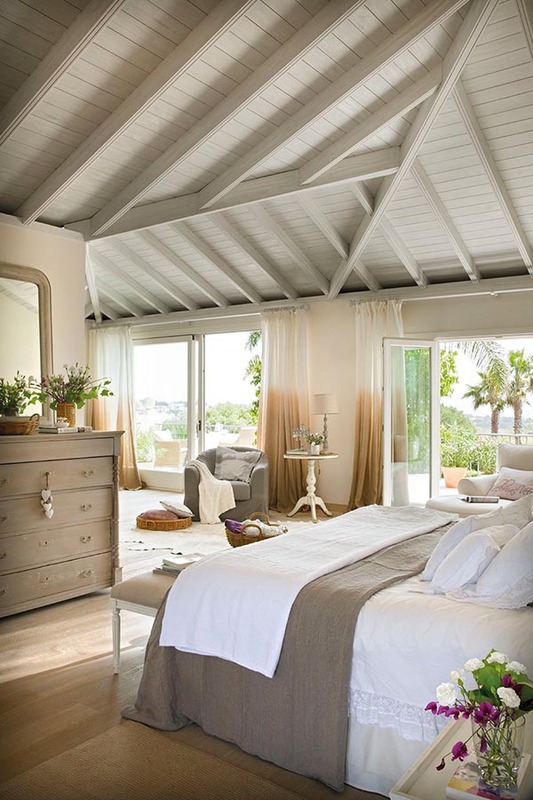 Here is a great idea of how to easily (and cheap) re-decorate a master bedroom painted all in white. Adding a dash of brown color could really add some dimension and make the room cozier. However some of you may find them too old-fashioned, the striped walls in this master bedroom are the perfect enhancement to the beams across the ceiling here. The pleasant feel of the mint and the dirty white colors in this master bedroom is something that brings about an instant sense of peace and harmony. The large windows let the sunlight come into the room and make it even more welcoming. This majestic master bedroom with sitting area features rustic wood timbers accented with iron sphere light roundel over gray Greek key bed headboard on the bed covered in white and gray stitched bedding alongside gray velvet pillow and stylish blanket in the same tones. The cute compact sitting area is placed at the foot of the bed boasting ivory tufted wingback chairs paired with a gray geometric rug. 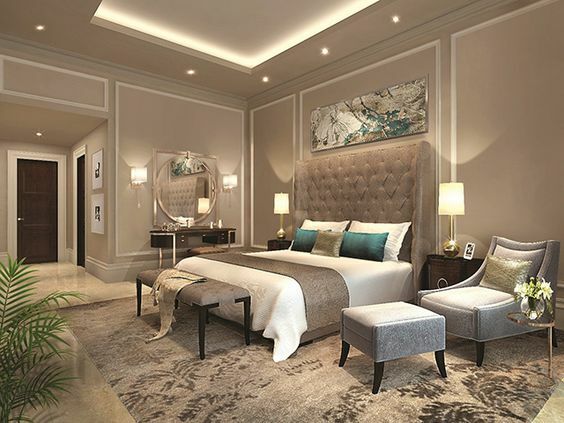 If you are looking for some ideas on how to transform your master bedroom into an ultimate luxury, there’s plenty to be found here. 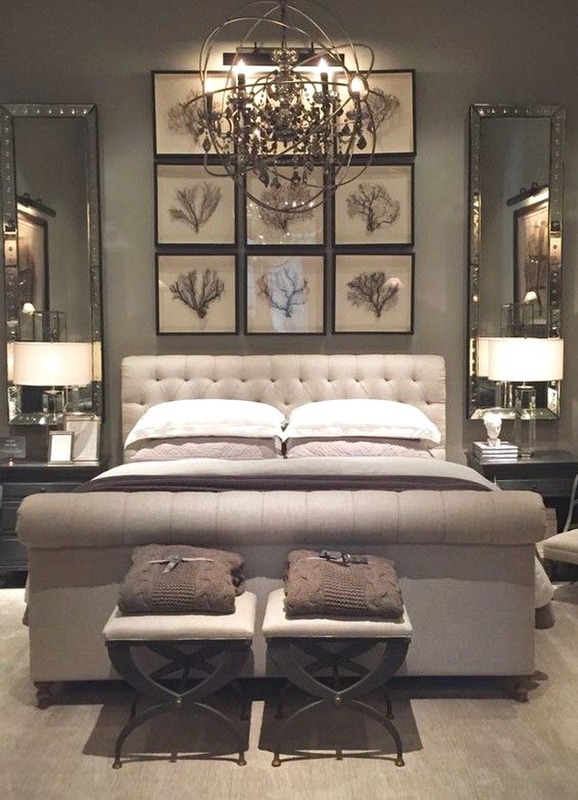 This stylish contemporary bedroom is a proof of how important the symmetry is. If you don’t want to play too much with your master bedroom’s design, why don’t you add some bold accents to the overall decoration? In this way, you will not get bored with sleeping there too quick. If you are one of those romantic souls this would be the best design for you. It is somewhat deluxe and classical. I would say it calls for reading old romantic novels on cold Sunday afternoons. 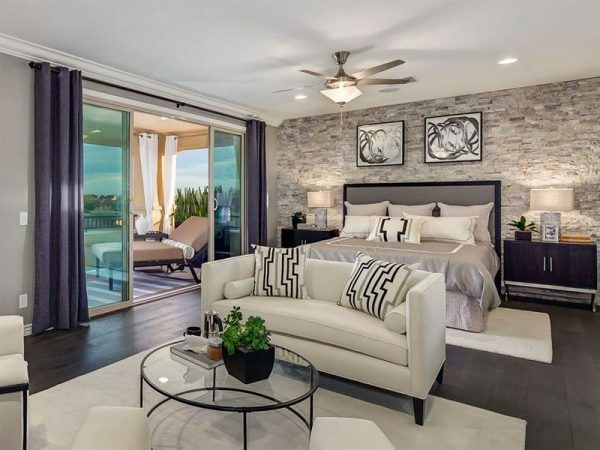 The outstanding master bedroom with small sitting area features hardwood floor and ceiling, and smooth grey walls along with a comfortable king’s bed surrounded by stylish walls. The chic master bedroom features a sand-colored accent wall lined with three black and white photos over a gray velvet bed dressed in monogrammed bedding flanked by white dressers as nightstands and oval glass lamps placed under windows covered in white drapery panels. The bedroom brags a cute sitting area equipped with gray roll armchairs lined with gray medallion cushions flanking a vintage glass top accent table. If you want to make your master bedroom with sitting area look as a whole unit, turn the beautiful armchairs to the master bed. Paint it in some bright tones to look more spacious. A detached lounge area in the master suite means that you can keep a light on to finish your book without disturbing your partner sleep. 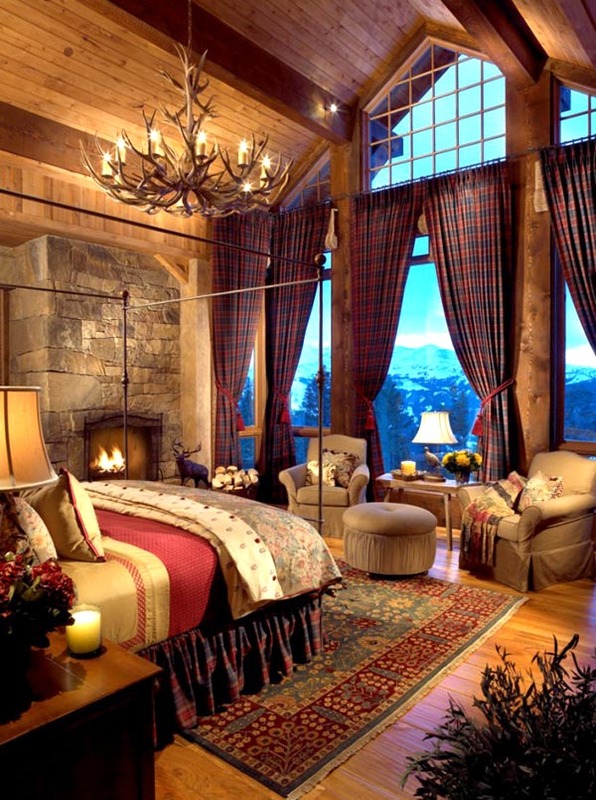 Moreover, the bedroom would be even cozier and warm if there is a fireplace. The high wooden ceiling painted in white, the windows to the floor, and the greenery make this master bedroom look bright, welcoming, and cuddled up. 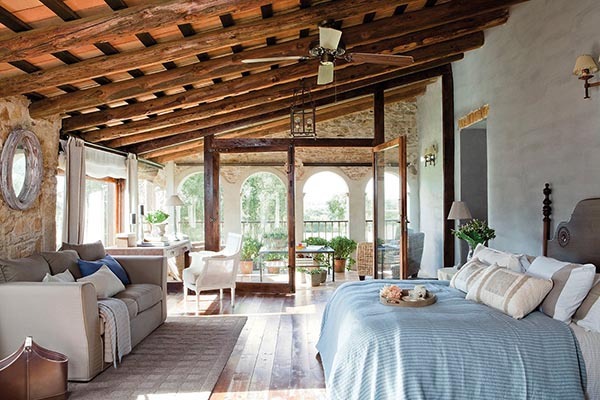 With a comfortable sofa, a high rustic ceiling, a work table and a terrace overlooking the garden, this master bedroom is the perfect lounging spot!